California's deadliest wildfire is almost fully under control, officials said, as fresh rain forecasts brought relief but also fears of landslides. The Camp Fire, centred in and round the town of Paradise northeast of San Francisco, is now 95% contained. Forecasts of fresh rainfall could help extinguish the remaining flames, but might also hinder rescue efforts. At least 83 people died in the blaze, and more than 500 remain missing. 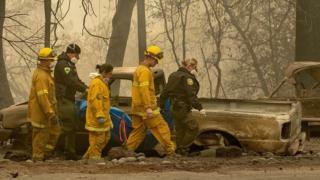 Workers have been combing through the debris from more than 10,000 homes that were burned down by the fire. Hundreds of people - along with cadaver dogs - swept through the debris of Paradise and surrounding areas in the search for the missing, wading through ash that officials fear could turn into a thick paste with the onset of rain. The rain that began to fall on Wednesday is the first significant downpour for the state in about six months. The National Weather Service said it expects a further 1 to 3 inches (2.5cm-7.5cm) of rain to fall from Friday to Sunday. However, Brian Hurley at the NWS's Weather Prediction Centre reportedly warned of a real risk of mudslides. "It's the vegetation that holds the soil in place," Mr Hurley told Reuters news agency. ""Without that vegetation, all bets are off when the rain hits." Sheriff Kory Honea of Butte County warned that the rain and mud may mean that the remains of some people may never be found. "What we're looking for in many respects are very small bone fragments so, as we go forward, it's certainly possible that not all of them will be located," he said. 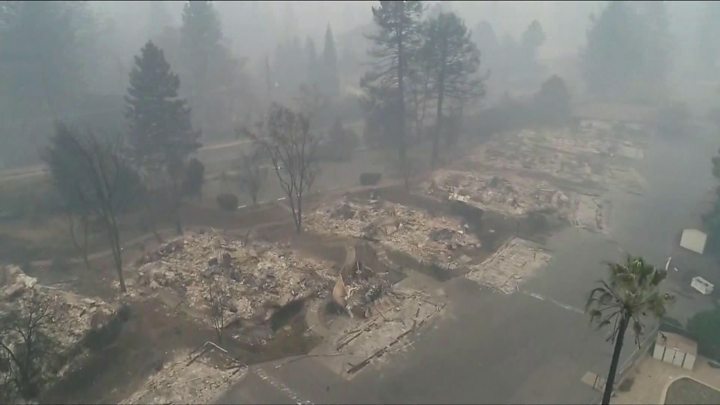 Investigators continue to probe the cause of the Camp Fire, as survivors spent Thanksgiving in warehouses and tents in the city of Chico. A separate fire near Los Angeles, known as the Woolsey Fire, was declared fully contained on Wednesday. California wildfires: Is smoke toxic to the East Coast?